Imogene See was born in Ossining, Westchester County, New York in 1848, daughter of Joseph W. and Hulda See, descendants of Dutch immigrants who settled in the Hudson River Valley in the 1600s. She spent most of her life living in Port Chester near her birthplace. Information about See’s artistic career is contradictory. She is cited in many artist dictionaries, encyclopedias, and biographical resources, although there are conflicting descriptions. Some say that she was self-taught or untutored or that she painted from photographs. Other descriptions claim that she was possibly the wife of a Nebraska homesteader or that she perhaps settled or traveled west in 1885. Finally, that See was a contemporary of Sallie Cover, another naive Nebraska painter. Ancestry.com in the Federal Census records and city directories consistently lists Imogene See as either living with her parents or later by herself as a resident of West Chester County, New York most of her life. She is never listed as married or as an artist for profession. The few See families living in Nebraska during the 1880s do not have a New York connection. 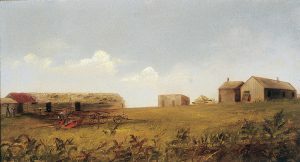 When Joslyn Art Museum purchased a See painting of a Nebraska farmstead dated 1885 from Kennedy Galleries, the director Rudolph G. Wunderlich, wrote Joslyn’s director Eugene Kingman, that it was one of five paintings of Nebraska farmsteads by See, all painted in 1885. Wunderlich went onto to say: “Imogene See lived in Ossining, NY and I can find no record other than these paintings of her travels west. Most likely she went there as a tourist and painted these scenes for her own enjoyment to show her relatives…s;. Since all of the Nebraska scenes were dated 1885 and there was no evidence of Imogene See living in Nebraska in the 1880s, Wunderlich probably has the most accurate answer of her time in Nebraska. She likely travelled west in 1885 with friends or relatives to visit unknown individuals in Nebraska and painted these works. It is also possible that she may have been influenced by photographs to create these paintings. The still lifes that the Kennedy Galleries acquired indicate that Imogene See must have painted other works while living in New York but since the Federal Census records or city directories do not list her occupation as an artist, she must have not pursued painting as any means of financial support. See died in Ocean Grove, New Jersey in 1940 where other See family members were living. The Museum of Nebraska Art has one work by Imogene See. Researched and written by Gary Zaruba, 2013, a project of MONA’s Bison Society. Letter in MONA Library files, written to Eugene Kingman, Director of Joslyn Art Museum, Omaha, NE from Rudolph G. Wunderlich, Director of Kennedy Galleries, New York City. Jul. 21, 1964. U.S. Federal Census records 1850 – 1930 and New York City directories. Ancestry.com website.